Talk to one of the three TzHaar gathered outside the collapsed tunnel in the TzHaar city. To begin the quest, head to TzHaar City, found on Musa Point on Karamja, then head to the easternmost "Quest Start" symbol on the map of the city. 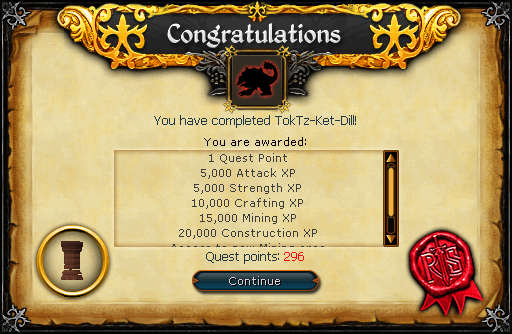 Talk to TzHaar-Hur-Frok, TzHaar-Xil-Tog or TzHaar-Mej-Malk, who will then tell you about the TokTz-Ket-Dill, a large armadillo-like creature that has dug tunnels under the city. They will tell you that, despite being strong and skilled enough to break through the blockage, such an act could collapse the tunnels and ruin the entire city! Of course, it is left to you, the only one small enough to get into the tunnels, to find and kill the TokTz-Ket-Dill. Go south and talk to TzHaar-Ket-Grol, who, after stubbornly refusing to change his language to suit you, will give you a stone tablet. Since you cannot understand the tablet, TzHaar-Ket-Grol tells you to go and see TzHaar-Mej-Lor, the librarian, who is found by going through the cave entrance directly west of the magic shop. Head to Reldo in the Varrock Library, who will tell you to search the shelves until you find the Tzhaar tourist guide. After reading the guide and the note on the inside, you will be able to translate the numbers and words on your tablet, which tells you that you need a rune pickaxe, 18 rocks (mined in TzHaar) and 14 Oak treated planks. You must talk to TzHaar-Ket-Grol again and select the correct options (a pickaxe, oak planks and rock) before being able to continue. 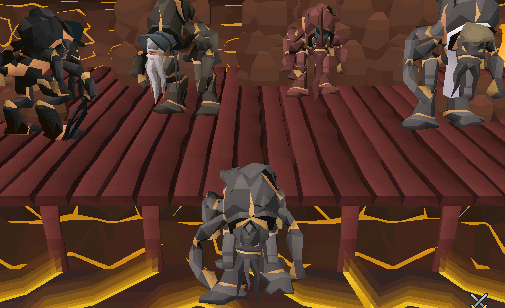 To have your planks treated, talk to TzHaar-Hur-Frok (where you started the quest), and he will treat any oak planks you have in your inventory (You can bank these, for now - you will not need them until later on). From TzHaar-Hur-Frok, go southeast and to the cave entrance and enter the mines. Talk to TzHaar-Hur-Brekt, and after explaining why you must be the one to go into the tunnels yet again, he will ask you for a favor - convincing the other TzHaar miners that theatre can be good! Tough call. Talk to him again, and tell him to change the plot to "no one gets killed, he merely robs" and then "the humans started it." Then talk to TzHaar-Hur-Klag, asking him how to make the play better. Select the second option, so that it is a TzHaar-Hur that gets robbed. Next, talk to TzHaar-Mej-Kol, repeating what you did before and selecting "one is a TzHaar-Mej who is aware of the situation." Ask the same question to TzHaar-Xil-Mor, and say "the criminal could be a TzHaar-Xil." Speak to Brekt again, and tell him that it needs an ending of "the criminal gets caught through joint efforts." Then tell him that the ending should be changed to "the criminal's plans are foiled," and tell TzHaar-Xil-Mor that the plans are not always foiled. You now have a good plot to the play, so tell Brekt that the other TzHaar are all happy with the plot. The next stage is to assign the roles. Simply match the following roles to each of the TzHaar (by talking to each one individually), and if they are not happy, modify them. KetKul-Schmul: TzHaar-Mej-Kol. Modify his role so that the criminal is tricked and only gets away with a small amount of Tokkul. JalYt-Jenny: TzHaar-Ket-Jok. Modify the role so that he is a TzHaar-Ket that gets defeated, but survives the attack (reject his second request of defeating the criminal). TzHaar-Hur: TzHaar-Hur-Klag. Modify the role so that he is robbed, not assaulted, and is called TzHaar-Hur-Klag. Brekt now teaches you how to safely mine through magma, and you will need to mine 18 stone slabs from the Obsidian walls in the cave (yielding 40 mining experience per slab - each part of the wall can be mined twice before you have to move to another, or wait for it to respawn). To make these slabs usable, take your chisel and hammer and use either one with each slab, making it into a pillar (yielding 20 crafting experience per pillar). Now to repair the tunnels (if you log out whilst inside the caves, you will return to the entrance). Take a decent amount of each the treated planks and pillars, your hammer and pickaxe and your Ranged/Magic attacks (the attacks are optional for now - you can come back for them later), then enter the crack beside TzHaar-Ket-Grol. The first thing that you will notice is a rock blocking your way - push it over to give access to a cavern with four wall cave-ins and three ceiling cave-ins. For the badly and very badly damaged cave-ins, use a stone pillar to repair it; for the others, two treated planks (your character will automatically put them both into place). If you try to use the wrong item for repair, you will be damaged for 300-400 Life Points. These are found on the walls of the cavern. You must do the same to these as you did to the ceiling cave-ins, with one exception - you must use a pillar only on the ones that are very badly damaged, and planks on the others. Note: Be careful not to wall yourself in when repairing with pillars! If you do find yourself stuck, you can click "push-over" to knock it over, but you will have to get another pillar to repair the tunnel. Note: Making any repair, with a pillar or planks, will yield 40 Construction experience. When you have stabilized all of the cave-ins, you will be able to mine-through the tunnel to the east. Go through this tunnel, and, if you do not have your Ranged/Magic attacks ready (and a couple of pieces of food if you think you'll get hurt in the fight), head back through the tunnel (this is where you will come out the next time you enter the tunnels). Re-enter the tunnel (if you left to re-stock), and you will find yourself in a second cavern, with a level 76 Fire monster on the other side of some stepping stones - you cannot cross these until you defeat the monster. It will attack with fire spells, similar to Fire Blast, and it is advised that you attack back with Water-based spells. After you have defeated it, repair the three walls and one ceiling cave-in before crossing the stepping stones, to repair the two wall and three ceiling cave-ins (being careful not to wall yourself in). When you are done, mine through the collapsed tunnel to the north and go through. The next cavern you must repair has another Fire monster, and two Lava monster, all level 76 (if you wish to restock on building supplies and food/runes/ammo, do so now). The first Fire and Lava monsters are found to the north, and can be fought without interference from the other Lava monster. Lava monsters must be defeated with Ranged attacks, and the Fire monster with more Magic attacks. You may wish to use Protection Prayers - Protect from Missiles if you have good Magic Defence, and Protect from Magic if you have good Ranged Defence. However, a couple of pieces of food should see you through the fight. When you have finished those two off, go back to where you entered the cavern, and head north, jumping over the cave-in to the east. 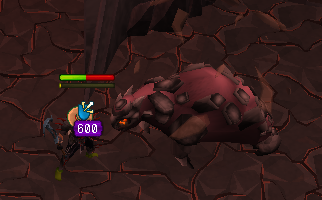 Kill the Lava monster with Ranged attacks. Now it is just a case of repairing the damage, without walling yourself in. Make sure you have the remaining 8 pillars and 2 planks in your inventory (possibly bring some spare pillars in case you get stuck). Head as far west as you can on the first side, and then a little to the north to find a not-very-badly damaged ceiling cave-in, repairing it with your remaining planks (the rest of the damage can be repaired with pillars). Head out of the room, sealing it off with a pillar, and repair the cave-in to the south. Go east until you see another tunnel leading north (where you fought the second Lava monster), and repair the wall cave-in. Jump over the ceiling cave-in to the south, and repair it. Go further south, following the tunnel until you reach the second wall cave-in, which you should repair before heading out and repairing the cave-in you just passed. Go east, repairing the wall cave-in, and cross the stepping stones, before mining the collapsed tunnel to the east. Go through, and you'll be glad to hear that there will be no more repairing from now on! Now is the time to prepare yourself for the fight. Talking to one of the TzHaar-Hurs will reveal that the TokTz-Ket-Dill lives in the cave to the north, but you can head south and clear the collapsed tunnel to restock (the tunnel leads to where you started the quest). TokTz-Ket-Dill is a level 92 creature that attacks with Melee and Ranged, but without the Ranged Protection Prayer, his Ranged attacks can hit 200+ Life Points frequently. If you wish to melee the creature you will first have to get through its armour. Do so by attacking him with a rune pickaxe. Players using magic spells will not have to go through the armour. TokTz-Ket-Dill also has a special attack where he pounds the ground, causing 1000+ damage. If you wish to avoid these attacks, leave the area when the TokTz-Ket-Dill shows sign of using his special attack. Switch to your weapon with a crush or magical attack and continue to attack, keeping an eye on your health and healing/drinking your Prayer potion when needed. Eventually, you will kill it, and it will drop 1000 Tokkul and Big bones. Head back to where you started the quest (you will notice that the tunnels you worked your way through earlier are now sealed off), and talk to one of the three TzHaar. After giving thanks and, surprisingly, compliments (for the first time during the quest! ), they will reward you. TokTz-Ket-Ek-Mack - After watching the finished play. After you have finished the quest, you can talk to TzHaar-Hur-Brekt again, and ask to watch his play, unlocking a new sound track and showing a rather amusing Opera. You will be very glad to hear that you can watch the play again by talking to Brekt at any time.